So, I finished the first draft of my novel on the day after Thanksgiving. Many, MANY moons ago, I printed out a hard copy of what I had already done (less than half the finished work) and started editing those pages. I got through ten chapters before I put that down and didn’t look at it again. Eventually, I went back to writing with a renewed vigor and determination (and another round of NaNoWriMo to motivate me.) Since I finished the first draft I decided to go back through those old edits and update the soft copy before I did anything else. Interestingly, many of those edits had already been done in the soft copy, which tells me, not only that I did them during some other burst of editing, but also that I was on the right track since I thought the same thing more than once. I finished that last week. 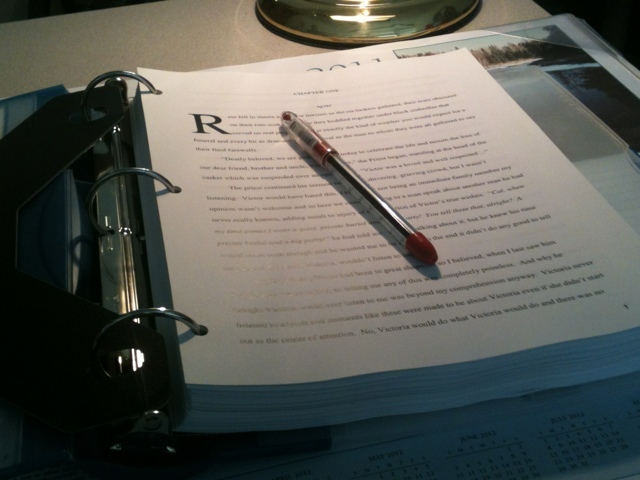 My next step is to go through the hard copy, with a red pen, and hopefully a clear, unbiased mind and edit it again. I know there are sections that need work. I know that there will be rewrites to be made, but I’m pretty excited about this process all the same. This entry was posted in Books, Life, My Story, Stuff and tagged constructive criticism, NaNoWriMo, Novel, Publishing, writers workshop, Writing. Bookmark the permalink. I think all of us bloggers have the desire to do what you’ve done. But not many of us take the leap. You did! Thank you very much! It’s pretty exciting!